2.4″ HIGH QUALITY SCREEN: Show real-time video and audio by clear pictures. Monitor's LEDs can indicate the level of sound activity in the room, allowing you to check your little one's condition by a simple glimpse. 2 WAY TALK & 360° ADJUSTABLE CAMERA: Two-way video talk allows you to talk or soothe your baby when necessary. Manual Pan (360 degrees) & Tilt (60 degrees) make the camera fit your needs by free position setting. LONG TIME HOLDING: The working time can be up to 12hrs when ECO mode is activated. Once ECO is on, the 2.4″ display screen of parent unit would turn off when there is no voice detected from baby and screen would turn on when baby unit detects the voice from baby. Always worry about baby in the night? No time for housework and little break with family and friends? With this Video Baby Monitor, We can help you change from a busy and tired mom to a relaxed and great mom! The distance between you and baby is always ZERO. 1. Calm your baby with your own voice by two-way Talk. 2.Automatic infrared night vision allows you to keep an eye on your baby without the need for any lights to disturb the little sleeper. 3. Multi-Camera Expandability-can be paired with up to 4 cameras in different rooms. 4.No need to connect network or wifi and worry about being hacked. 5.Know your baby's room temperature with temperature sensor all the day long without worries. 6.Up to 960 feet (open space) with out-of-range warning. Have more Freedom in Nursing Your Baby.100% digital technology for privacy and security. 1. Before you use the product, please fully charge the battery in the parent unit, so that it continues to work if you disconnect it from the power supply to carry it to another location. 2. Box contain 1 baby camera and 1 parent unit. Extra cameras are not included in the package. 3. The parent unit includes a rechargeable battery. The camera needs to be plugged in when using. Click “Add to Cart” now and start having a new and perfect way to take care of your little angel! 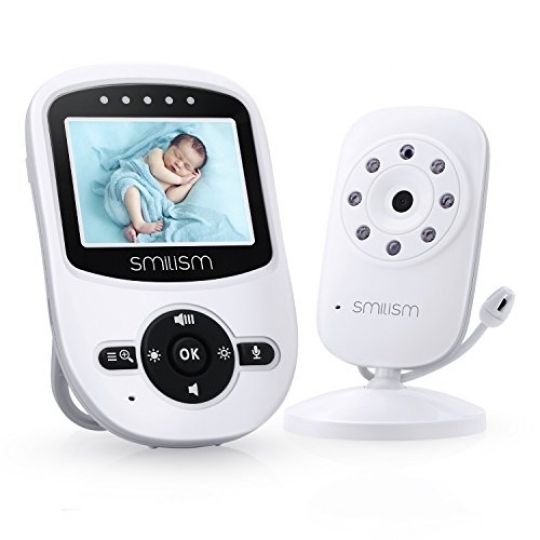 INFRARED NIGHT VISION: Automatic infrared night vision function allows the camera to adjust to the level of light in the room and pick up clear black and white image of your baby or the monitored area in dark or low-light conditions. TEMPERATURE SENSOR & OTHER FEATURES: Temperature monitoring helps you observe the baby room temperature all the time. There are also 4 lullabies to lull your baby to sleep in a sweet dream and you can check the little sleeper by zoom-in function.